To add a new service, navigate to Services. Click on ‘Add Service’ on the top right corner of the page. Select the location (if any) and a service type. If you select a service type that has been previously populated with content, it will automatically fill out some of the form for you, all of which an be changed if required. Enter the name and select the date of the service. 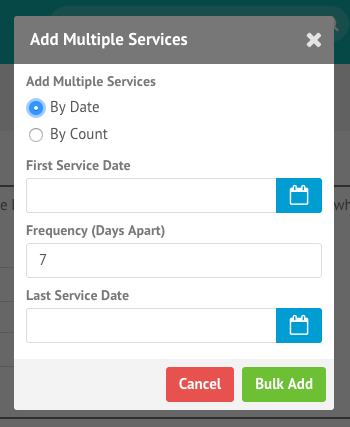 You can also add multiple services at once by adding more lines or choosing ‘Bulk Add’. 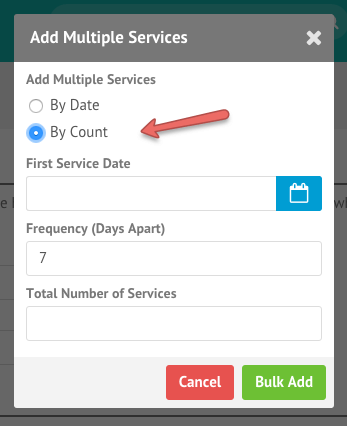 The ‘Bulk Add’ modal allows you to add multiple services either by date or by count. To add by date, please choose a start date, a frequency of services (default is 7) and an end date. To add by count please choose a start date, a frequency of services and the total number of services you wish to add. Add the time of the service here. If you have more than one Service (e.g. 8:30am and 10am), simply click on the green plus icon to add more service times in. Specify other times (e.g. Rehearsal Times) to this service. This will also show up on the Roster located in the Member Area so make sure you give them a proper name that is easily understood by your volunteers. Once a service has been created, click on the ‘Plan’ tab to edit your service structure. Include any headings, service items or songs you like in the service plan. Click here to learn more how to set up a service plan.